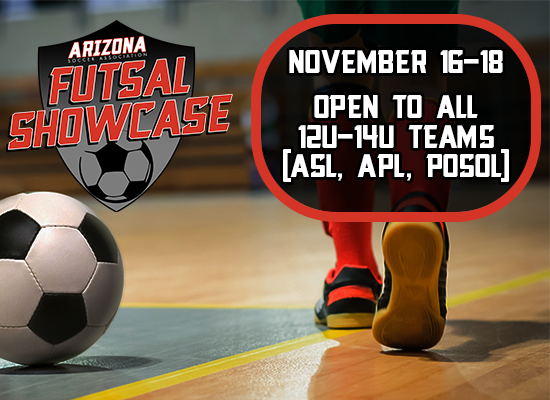 Boys and Girls U12-U14 teams that registered for Arizona Premier League (APL) are required to participate in the 2018 Futsal Showcase unless they are participating in the US Youth Regional League - Desert Conference. Entrance fee to the 2018 Futsal Showcase has already been paid for when registering for APL. Boys and Girls U12 teams that registered for Arizona State League (ASL1 and ASL2) are required to participate in the 2018 Futsal Showcase unless they are participating in the US Youth Regional League - Desert Conference. Entrance fee to the 2018 Futsal Showcase has already been paid for when registering for ASL. All Boys and Girls U12-U14 teams are welcome to register for the 2018 Futsal Showcase. There will be different divisions that can be selected. Teams are welcome from POSOL, PCJSL, ASL, or any ASA Sanctioned League. If any teams want to form a second team to enter the event they are encouraged to do so. Registration fee for 2nd team: $175/team. Any team wanting to divide up and form a second team to enter may register at a $75 discount for the second team. While registering using the Google Doc below, teams should feel free to be creative in selecting an event name. Roster Size: Maximum of 12 rostered players per team. Players may only play on one team with the exception of a designated goalkeeper that can play on one team per division but can play on a second team in a different age group.